Yesterday I uploaded new ISO images for Slackware Live Edition, release “0.6.0“. Then I waited a bit before writing this article to allow the mirrors to catch up with the 8 GB of new files. 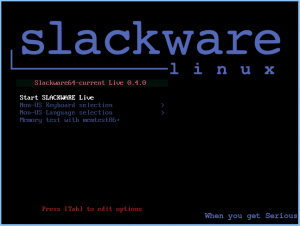 Check out my previous articles about Slackware Live Edition for more background information and read the README.txt file provided with the “liveslak” sources to get a grasp on a more technical level of how this all works. You can now use an encrypted container file to store persistent data. The “iso2usb.sh” script was extended with a new “-C” parameter that allows you to specify a size for this LUKS container file, quite similar to what you already could do for a LUKS encrypted homedirectory. The data on your persistent USB Live will be safe from people who steal the stick from you. A hard disk installer was added to all Live variants except the minimal XFCE. As far as I am concerned, the XFCE version is nice to run as a small Live OS but unsuited for hard disk installation. This works straight from the DVD, and also in USB versions. You will be able to install the latest Slackware64-current, or the Plasma5 or Mate version to your computer’s hard drive, in the background while you are working/playing in your Live Desktop. From within the Live environment (either at the console or in an X terminal in your running Desktop Environment) you can call “setup2hd” which will guide you. The script is a modified Slackware setup as known from the official install media, but it has already made the choice of package SOURCE for you. Note that you are responsible for partitioning your hard drive before you call “setup2hd”. This aspect is no different from the regular Slackware installer. The “setup2hd” script will install all the active Live modules to your hard drive (this encompasses all “system” modules, and furthermore including modules in addons/” and “optional/” which you enabled). Documentation was added. A README.txt file contains all the details of using the Live Edition, as well as technical background on how the liveslak scripts do their work. Customizing the Live Edition has been made easier. You are no longer tied to the choice of “SLACKWARE”, “PLASMA5”, “KDE4”, “XFCE”, “MATE” or “CINNAMON” when generating a new ISO variant. A “custom” variant with its own custom name and custom post-install configuration is now also possible. I have created ISO images for the SLACKWARE, XFCE, PLASMA5 and MATE flavours using the latest Slackware64-current packages available (Tue Feb 23 19:31:59 UTC 2016) as well as latest Plasma 5 and Mate releases. These mirror servers should have synchronized by now. The ISOs have two user accounts: root (with password ‘root’) and live (with password ‘live’). My advice: login as user live and use “su” or “sudo” to get root access (note: “su” and “sudo” will want the live password!). Posted: 25 February, 2016 in Me, Slackware, Software. Congrats for Beta 6, Eric. I just had a look to setup2hd. Well done! gettextizing it wouldn’t take me more than one hour if you are interested. It would also be easy to cherry-pick the already translated messages from Slint PO files. Just a few new or modified ones would need to be translated in addition to those. So I see no issue technically speaking. But of course I can understand that seeing what they get in Slackware Live some users could request an internationalized installer be included in Slackware, not realizing the implications regarding maintenance of a far more complex installer and associated config scripts, and I assume that would worry Pat. Anyway, thanks for this Beta 6. Indeed, maintainability is what withheld me from implementing setup2hd as an internationalized installer. I would be dependent on a dozen other people to supply translations and I hate to be dependent, so that was not an option. Furthermore, with an internationalized installer, the non-english speaking user would be confronted with US-english Slackware tools and man pages, so this too would have to be addressed. And at this point, the slint changes would modify the stock Slackware setup. I want the SLACKWARE variant of the Live ISO to be void of 3rd party stuff so then I would have to maintain two separate installers. It’s just too much work for this small side project. Hello Eric, thanks for liveslak 0.6.0. No issues with german keyboard anymore. Everything works as expected. Now I will start to do some customizations and build my own modules. Howdy! Fired up LIVE – it seemed to be doing well, and then it just sat at a black screen at the loading of X11. The system has an old NVidia card in it 7500 me thinks. Will try again with a different card later today. Downloaded and did a frugal install of the XFCE version. Everything seems to work as expected. So just one more time : thank you very much. Nice piece of work! Owen – try adding a “3” to the syslinux or grub boot command and you will end up in runlevel 3 (console login). Then run “startx” in the hope hat you are able to catch some errors. Installing from usb at the moment. One problem when I select UK keyboard at the start of the install process still get US keyboard. Phil, that may be something I need to fix in setup2hd… I copy the “/etc/rc.d/rc.keymap” from the ISO to the harddisk irrespective of your choice. That is not OK of course. In iso2usb.sh, the BIOS Boot Partition is built. Where is this partition used? In liveinit, two lines are identical. In make_slackware_live.sh, KGEN is changed for the 32-bit Slackware. Off-Topic: Is there a way to subscribe to an article’s comments without actually commenting? Thanks SangDae, I have applied your suggestions & fixes. Ricardo, I did not see a way to enable a subscription to an article’s future comments without actually commenting yourself first, but I added a generic “Subscribe to Blog via Email” widget to the right sidebar, which will subscribe you to any future update (all new posts and all comments). I was successful in running Init 3, and then start X (startx) the boot process is DOG slow, I got the KDE splash screen for 5 seconds, and then it went to black. The cursor is on the screen, as it is not black in color…but so far I am only getting a black screen using LIVE Plasma 5 ISO. I was getting IO errors from the disc, so I burned another disc. I did not see any errors while loading X. Thought I would share my experience with you. Thanks for all your hard work on this. I’ve been running it now for 20 minutes and so far nothing has broken, or is glaring as a problem. Owen, Plasma 5 and its graphical login manager SDDM are heavy on the machine, so you will notice slow startup on “older” computers anyway. But running it from a USB stick as a Live OS puts additional demand on the quality of that USB stick. With a stick that has fast read speeds, you will be a lot happier. twotonman it seems I must add wxGTK to the package list, it is a dependency of p7zip. let\’s say i download xfce version and put it to a USB then what ??? Well at least thanks to my friends in the Slackware coreteam I figured out what was wrong in my grep command. Updated script will be moved to git as soon as I have my new test ISO ready. Thanks Eric for your all scripts. What a nice live USB drive! However some efficient codes are found in iso2usb.sh as follows. SangDae, the code in iso2usb.sh has nothing to do with the delay between the “Welcome to GRUB”” line and showing the boot menu. That delay is internal to the startup of GRUB. The initrd only comes to play when you have selected your boot options from the GRUB menu. The delay mentioned in the script is meant to give the Linux kernel more time to initialize slow USB medium. thanks a lot for your work – you are the best. I have installed the live iso 0.6 to harddisk. I also installed genymotion 2.6, and it is working. i forget to tell that i use the plasma iso. I have a small suggestion that’s easy to put into practice. The README text (http://taper.alienbase.nl/cgit/liveslak/plain/README.txt) is weirdly wrapped… or not wrapped at all. On my monitor I have several hundred characters per line, which makes it somewhat difficult to read. Suggestion: wrap the README to a more classical format, e. g. something like roughly 80 characters per line? Niki, that README wraps nicely in my browser (chromium as well as firefox). Lines in the README are indeed long, but I do not see that as an issue. I imported the README into the SlackDocs wiki as http://docs.slackware.com/slackware:liveslak by the way. _ with the /boot/syslinux up one level (becoming /syslinux): idem. However, booting the ISO as a virtual CD in a VirtualBox VM, there is almost no delay. There is also almost no delay booting in legacy mode (thus using syslinux instead of grub). So i assume that yes the delay is due to GRUB, but especially when booting off an USB device. I didn’t try booting off a “real” CD or DVD though, thus i don’t know if a delay similar to the one observed with an USB stick would occur. Maybe that doesn’t matter much as probably few people would use a CD anyway. Does the “Frugal Install” can use persistence.img. @alienbob, thanks for the widget! I’ll check it out. Jim, yeah obviously the ‘gmtk’ package needs a rebuild on slackware-current. Thanks for checking and reporting. Using the latest current from 23 Feb, and it boots very quickly and is running well on a usb3 stick. Pale Moon won’t compile and run. I tried starting it in konsole to get any messages and all I get is ‘segmentation fault’. It compiles just fine and installs with no hiccups. Okay, I lied…three boogers…I still have to go through all the bs to get my controls I use in a mixer (kmix), by adding and deleting in a few .conf files (as per this conversation here https://www.linuxquestions.org/questions/slackware-14/slackware-14-2-beta-a-few-remarks-on-pulseaudio-and-audio-quality-4175568088/page3.html ). Other than these, it seems it’s still just getting better and better and closer to 1.0. These apps don’t open for PLASMA5. No time for double check. Cheers. “Copy http://slackware.uk/people/alien/liveslak/graphics/0060-nvidia-352.79_4.4.1-current-x86_64.sxz to the “/liveslak/addons/” directory of your USB stick (if you used the Plasma5 ISO then this file is already in /liveslak/optional/ so you can simply move the file from optional to addons). Unfortunately that doesn’t seem to work on this latest liveslak 0.6.0 ‘current’. It gets to the install of it, then goes to a blank screen with a blinking cursor forever. Jim you dump a shitload of application package names here and yell “These apps don’t open for PLASMA5. No time for double check”. At least tell me what does not work. How did you create the list, seems auto-generated? I tried random programs in a Live ISO I just booted without persistence and kmahjongg, ksirk, skanlite, okteta are working for me. Blogilo does indeed not work because of the upgraded libical.so. There may be others but don’t leave it to me to guess please. Grog, debug your issue and let me know if I need to change anything. The shutdown problem was as I suspected, one needs to become a member of group ‘shutdown’ which needs to be unchecked in ‘groups’ to even be seen by ‘user’ to become a part of it. I have no reason why this came about as usually I’ve never had to do this as a user. The pulse/alsa audio thing I can handle, it’s just that it has to be done at all, but seems more folk use bluetooth than those of us who use our systems as our music for the house and parties etc, heh. Oh well. Nothing you can fix there. I have no clue how to debug/figure out the problem with the nvidia not installing as it did on the 0.5.1 beta of ‘current’. I even made sure it’s executable, but it made no difference. I’m not trying to make more work for you, I just don’t have the knowledge for much of this debugging stuff. Grog, the nvidia issue is caused by the fact that the module http://slackware.uk/people/alien/liveslak/graphics/0060-nvidia-352.79_4.4.1-current-x86_64.sxz is meant for a 4.4.1 kernel (which I show by using the kernel version as part of the module name). The 0.6.0 Live ISOs you can download have Slackware with kernel 4.4.3, therefore the package you downloaded is missing the kernel module for that version. But the install script will tell X.Org to use a nvidia kernel module which leads to your black screen. The Plasma5 ISO itself contains the proper version of the nvidia module in the /liveslak/optional directory, if you move or copy it to /liveslak/addons it will be used automatically on every boot. I also refreshed the public download locations such as the one you were referring to, so that the proper nvidia squashfs module can be downloaded from http://slackware.uk/people/alien/liveslak/graphics/ now. i want to apologize, you are correct. I use a live iso on usb. PLASMA5 0.6.1,without persistence. The previous list is a result from Application Finder. I checked all the applications one-by-one. Theese apps on the list didn’t launch. Today I tried from the commandline, all ok except: akonadiconsole, blogilo, cervisia, krubyapplication, kalarm, kgpg, kmail, headerthemeeditor, importwizard, korganizer and ktnef ( error… libical.so). I hope I make sense. I appriciate your hard work. All the best. Well crud. It was so obvious if it had been a snake it would have bit me. Sorry for making more work for you, i just really want to help, and there will be folk like me using this who aren’t the best at coding or even have an idea what to look for at times and I figure that’s a different perspective to keep an eye on. Anyway, thanks for the help with this. Where can I find the 4.4.2 nvidia sxz package? Or better yet, how do I make an sxz package like the ones you have on the http://slackware.uk/people/alien/liveslak/graphics/ site? Read the end of http://alien.slackbook.org/blog/beta3-of-slackware-live-edition-is-available/ if you want to know how I create that nvidia squashfs module. I re-downloaded the ‘current’ liveslak from ‘latest’ (I even reloaded the page to make sure I was getting the actual latest from 0.6.0 current). I re-did the install to my usb stick using iso2usb.sh. I also again did a luks system on it. I then copied the 4.3.3 nvidia from your link to the ‘addons’ so that when I booted to the usb stick it would automatically load. Multimedia: Hardware settings – set to use my only card an SB Live! This particular time I forgot to make ‘user’ a part of ‘shutdown’, but the shutdown button worked sort of this time as it allowed me to *only* shutdown the computer, no reboot or anything else. Anyway, when I rebooted to the stick, I got to the ‘live’ window where I enter my password and all it does is blink once then bring me right back to the same window where I enter my ‘live’ password. It will do this as long as I have the patience to keep entering my password. It *does* still have the choices of desktops to try/use (none being chosen made any difference btw), and also console login – which I know nothing to do with on this particular setup with a live usb stick. All I can do is reboot to my regular hdd system and wonder what went wrong. As far as I can figure nothing I ‘changed’ to suit me should have made anything go haywire, but this is the second time in a row I’ve done this in the same exact way and it not let me to my desktop. I also forgot to mention that before I ever booted to the usb stick and made all those changes in my last post, I had put the nvidia module int eh ‘addons’ directory and of course when I did boot to the usb stick it *tried* to install it. I have a feeling that something is being leftover and is messing with the system by leaving small portions of who-knows-what instead of simply not installing anything at all from that nvidia module (I hope that makes sense to someone). Had similar problem on my laptop. Try checking the ownership of your ~/.Xauthority file. Now and again mine would change to root. If you boot to runlevel 3 and then delete the file you should be then able to boot to Plasma 5.
which was causing the problem. Commenting it out did the trick. Don’t know if this is the same problem as you but by deleting the ~/.Xauthority file you should be able to get back in. @Phil – Thanks for the advice. Unfortunately that didn’t help anything on the stick liveslak. I booted up to the loging screen and then dropped to console login and then to root in that and opened mc (gotta love mc!) and found that file and commented it out. Still didn’t work. I even deleted the file and no go. I even found an nvidia ‘egl’ something or other and deleted that as I couldn’t install the nvidia anyway and that looked to be something that stuck in the system even though it shouldn’t have since it was for the wrong kernel. That didn’t help either. bleh, heh heh. Oh well, that’s the good thing about this ‘live’ stuff and a fast usb stick – I can just start again and try something else and see what happens and maybe help pinpoint what or where things are going wrong. I’m going to try this time to make all those same exact ‘changes’ but *without* trying to install the nvidia module in any way. I build a bunch of modules and copied them to the addons folder. All modules work as expected. But it seems that for some reasons I can not add more than something around 48 modules. If I add more the boot process will not finish (X does not start) and I am dropped to a shell with some error messages (varying content). After this occurs I must do a Ctrl-Alt-Del to reset. I reproduced this behaviour on different machines and different mixtures of my own modules. I use the Plasma 5 edition with bootparameters nop luksvol= . That happens probably because I did not expect people to add this amount of add-on modules to be honest. If you are all about modules then you might want to reconsider if liveslak is the best solution for you – modules can not be added on the fly like SLAX or Porteus does it. However the fix should be easy. You can increase the number to something larger than 64 and that will allow a larger total of modules to be mounted in the Live OS. I am going to increase the default of 64 and will also add a boot parameter “maxloops=” to change that default at boot time. Thanks for the fast fix Eric! You are right about Porteus. But the problem is, that I have a brand new Skylake CPU and Porteus isn’t able to boot on this machine (even with the alternative kernel you can get as an update). At the moment liveslak is the best choice for me and because it is very similar to Porteus this is a very good alternative. Maybe it would be good to have those 2 included, so it can compile out of the box. out which packages are missing. 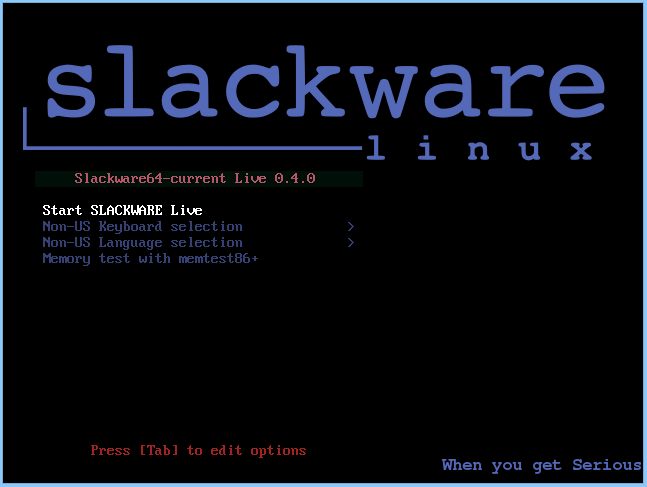 twotonman, Slackware Live Edition is the product of my ‘liveslak’ scripts, and those scripts are not at fault here. You are looking at one of the scripts’ output products (a Live ISO image) and the content of those ISOs is based on several package repositories. The one you inspected is the Plasma 5 variant. It comes with a lot of packages that build on top of Slackware-current, replacing several stock Slackware packages. The result is that some of the other stock Slackware packages will experience library linking issues – however in many cases you won’t touch upon a situation where you will be affected by that. You must realize that Plasma 5 for Slackware-current is a testing ground on top of a testing ground (albeit slackware-current at this moment in time is quite stable) and if Slackware programs break as a result of using Plasma 5, then I may or may not fix that, depending on the free time I have. Compiling costs time. Time is what I lack most. Now, back to the linker errors you mentioned. Actually, one of them is an omission on my part, which I cure in the next release of liveslak: I forgot to add the ‘podofo’ package to the Plasma5 ISO image. Hence the calibre error. The nautilus error can not be resolved: the dropbox package is a binary re-packaging of a Fedora RPM which expects Nautilus to be present on the system for which it provides a plugin. We do not need that plugin because Dolphin in Plasma 5 (and in KDE 4 too by the way) has its own dropbox support extension. The akonadi error about libical has been fixed some time ago in my ‘ktown’ repository but that was after the release of liveslak-0.6.0. The remaining errors are all coming from Slackware’s calligra package. If you want to get rid of all these errors you will have to recompile calligra. I may, or may not, do that at some point. If you show me a situation where you run into this error and a program does not work as a result, that may give me more incentive. Michael if you use the Slackware ISO instead of the XFCE ISO you will not have any issues at all compiling a Linux kernel.